Good, natural and organic deodorants are hard to find...especially in the country I live in. So, I really thank God for Online Shopping, that makes things easier for me to get what I want. 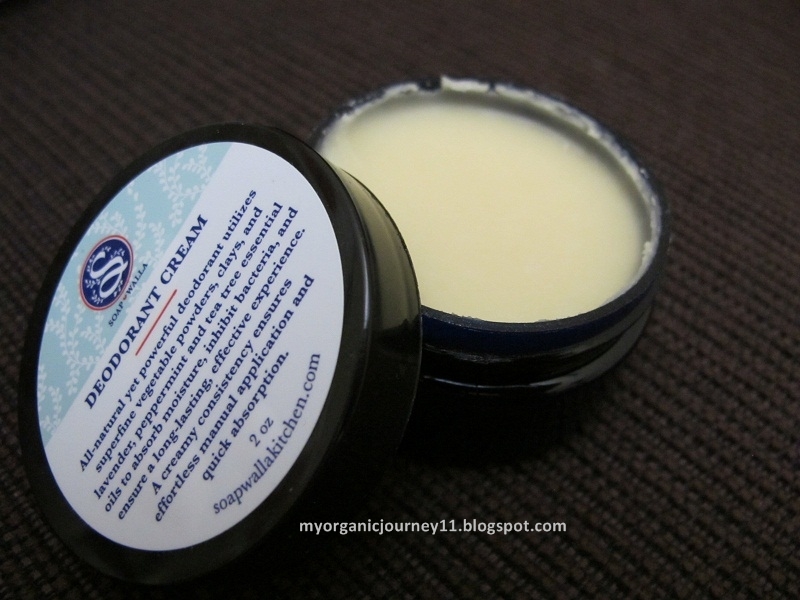 I was searching high and low for natural based deos ( one that last ) and thanks to Google, I came across Soapwalla's Deodorant Cream in Etsy. This product generally received lots of good reviews and without much hesitation, I quickly place my order because I was desperate...yeah, pits were smelling big time! 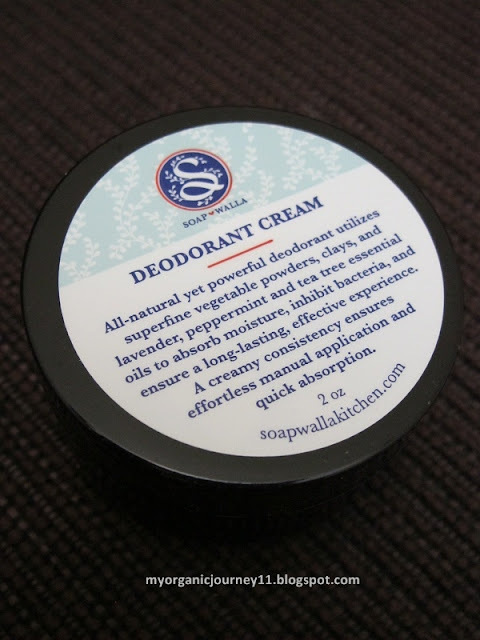 Soapwalla's Deodorant Cream is free from harmful chemicals, petroleum, or aluminum (linked to alzheimer's and breast cancer), is vegan, and is never ever tested on animals. Soapwalla's deodorant cream is effective at absorbing moisture; because I do not use aluminum, it is not an antiperspirant. Organic Simmondsia chinensis (Jojoba) Oil; Organic Helianthus Annuus (Sunflower) Oil; Organic Rosehip Seed Oil; Butyrospermun parkii (Shea) Butter; Organic Corn Starch; Sodium Bicarbonate; Kaolin Clay; Organic Vegan Kosher Glycerin; Essential oils of: Organic Lavandula Angustifolia (Lavender); Organic Melaleuca Alternifolia (Tea Tree); Organic Citrus Sinensis (Sweet Orange); Organic Mentha Piperita (Peppermint); Citrus Aurantium Bergamia (Bergaptene-free Bergamot). My deos usually comes in a spray bottle, roll on or a stick...and this is first time that I have come across one that is in a pot. The product itself is thick and balmy and one needs to be aware that the solidity of the deodorant may alter, depending on the temperature fluctuations in your country. In the hot and humid country like Malaysia, mine will be slightly soft, unless I placed it an air-conditioned room. The reason being that it can alter because Soapwalla does not use any unnecessary waxes or hardeners. One thing that you will be drawn to this deodorant is the scent. One sniff of this automatically floats me up to heaven! It smells so GOOD! It is refreshing, with nice, calming scents of essential oils. Two words to describe: SIMPLY DIVINE! Now, many will find scooping out some of the cream from the pot with fingers may deem unhygienic. To avoid contamination, I use a clean mini spatula, to scoop a pea size amount for my pits. I was surprised to find that the cream is soft once applied and has fine particles ( from the clay ). You may feel there is a tiny bit of oil yet it does not make my pits oily. Now on to the test smell. I have strong odour and sweat easily. Now, with this one, it endured the stinky and wetness factor. I smell no odour throughout the day! No kidding! For the wetness issue, I would say it cut down the wetness by 70%. By mid month of using this, my pits were completely free from smell. This is a breakthrough for me! I gave some for my hubby to use and he has the same results as me. We were truly amazed by what this product can do in a short period of time. I also did a test wearing polyester tops. Some may know that this material does not absorb moisture easily and will permeate a 'terrible' smell, even when pits are with deodorants. With this deodorant, I did not detect a single unpleasant smell. Good, right? However though.....after using it for a month, my hubby's pits began to itch and he suspect that it could be the deodorant. He stopped for a few days and the itch stopped. Strange, right? Soon after his findings, my pits also start to itch slightly and I noticed some slight discolouration on my pits. I stopped using it for 2 weeks and my pits went back to normal. So I suspect that both me and hubs many be allergic to some of the ingredients. Just when I thought the light went off, I was surprised to find that during the time where I stopped using the deo, my pits were strangely 'smell free' and 'wet free'. ( I was au-natural at that time ) It was strange but I was actually happy! Means that I can use this three or twice a week and not everyday. This is a pleasant and great find for me, and I can safely say that my search for another deodorant can end at this moment. Not only does it smell utterly good, it also keeps my pit smell-free and wet-free throughout the day, which I haven't experience this for a long time. This deodorant can withstand most test that I had performed and though I had some unfortunate reaction with my pits, it was a blessing in disguise, no? This deodorant, at this time being, is definitely a keeper for me! This item was purchased by me for my personal purposes. This review is based on my honest and personal experience with this product and is not influenced by any parties. I am scheduling a review of this product tomorrow! Glad that it's working well for you and I'm quite intrigued about using this only two to three times a week. What a coincidence! Yeah, this control my odour very well, except that I allergic reaction to some of the ingredients. In my case, I am able to use this 2-3 times a week cause I had been consistently using this deo daily for a month plus. Somewhat, it 'neutralises' my pits. This is by far, one of the best I've used! Hi Vivi! :) Hope this will work well for you as it has to me. I've made my own deodorant with roughly the same main ingredients as above : baking soda and cornstarch. I used vegetable shortening as the carrier and vanilla for scent. It didn't stop from sweating but it whitened my armpits and they don't smell anymore. Have been giving it to my sisters and she passed them to her friends who love it!! Hey, may I know how you make your deodorant? I've tried once but the results were less than satisfactory..
hi, so nice to saw your posting, i have been using once a week and it can effectively control my pit smell but still will make the armpit darken, can i check this cream got abit whitening effect ?...thanks alot. Hi! Most effective or natural deos tend to make slight discolouration on pits. Though this soapwalla deo is excellent in masking and ridding the smell, it does have the tendency to discolour pits ( for me, that is ). Hi Elaine! I usually receive mine within 8-12 days. Hope yours arrive soon. And yes, it still works very good for me and I have since repurchased. Hi, i am intrigued! I too hv been on an organic journey and hv had lots of trouble with the underarms. I made my own, from a recipe i found online and it was working great till i started to itch. One website said its probably the sodium bicarbonate, which is alkaline, so i have to tweak the recipe abit . Anyway, i just discovered your blog! I am game to try this soapwalla. Will see how it goes. Thanks for your reviews! This is the first time i am reading your post and admire that you posted article which gives users lot of information regarding particular topic..